Q. I’d like the TimePilot software to highlight when an employee has accumulated more than an hour of overtime. Can it do this? A. Yes it can. The TimePilot IV software can also highlight any combination of eight criteria (more than a specified number of hours worked in a day, more than a specified number of overtime hours in a week, etc. ), and assign a color to each. Q. I forgot to reset the time on my clock for Daylight Saving Time, and now I have many transactions that are off by an hour. Is there any quick way to fix this? Click on the transaction(s) you want to change. To select more than one transaction, click the first, then hold down your Control key and click each of the other transactions. To select a group, click on the first transaction in the group, then hold down shift and click the last transaction in the group. All of the transactions in the group will be highlighted. Right-click on the newly highlighted transactions and choose "Adjust Transaction Dates and Times" in the pop-up menu. In the box that appears, enter the number of hours and/or days (use a negative number if you want to go back in time—for instance, if you want to change a transaction from 8 a.m. to 7 a.m.). Click OK. All the selected transactions will change. If your TimePilot IV software doesn’t show the "Adjust Transaction Dates and Times" menu item, you need to update your software. To do so, click on the “Help” menu in TimePilot Central, then choose “Check for Updates.” Follow the instructions that appear to update your software. Introducing our newest product: The iButton Receptor. 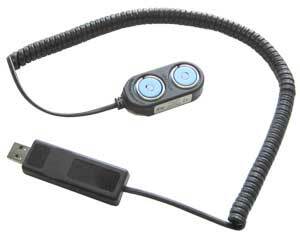 It’s really a simple device: two iButton probes attached by a coiled cable to a USB connector. If you use TimePilot PC, our software-only timeclock system, adding an iButton Receptor allows you to require your employees to clock in and out with an iButton, greatly reducing the possibility of “buddy-punching”—a situation when one employees clocks in another, even though the second employee is absent. With an iButton Receptor, you can require specific employees to clock in with an iButton and give other employees the ability to clock in with an ID number or an iButton. If you use TimePilot Vetro or TimePilot Standard, the iButton Receptor can make your life easier. Normally, you set up your software at the PC, and then assign iButtons to your employees at the Vetro or Standard clock. You have to assign the iButtons at the clock, because that’s the only place there’s an iButton probe to read the iButton’s serial number. TimePilot Vetro: Click here. If your e-mail program doesn’t support clicking on a link, you can find the instructions at https://TimePilot.com/Vetro/ReceptorSetup.htm. The iButton Receptor is regularly $59, but for those who receive this newsletter, we’re cutting the price to $49 until May 31! We’ve found a pretty cool free service that solves all these problems. It’s called Dropbox. Here’s how it works: You go to Dropbox.com, sign up with an e-mail address and password, and, optionally, install a small software program. As long as you have an internet connection, anything you put in your Dropbox is immediately synchronized on Dropbox’s servers. Make a change to a file, and the new version is immediately sent to Dropbox. synchronized across all of your devices. Here’s one way this can be used: One of our employees had a son living in China, and when the son wanted to share pictures with his parents, he’d simply put them in his Dropbox folder. Within seconds, they were backed up and copies had arrived on his parents’ computer in the U.S.